This week we sampled two recent newcomers: Dale Boca, which serves up South American twists on meat and potatoes; and Sweet Babu, a dessert bar that recently started offering breakfast and lunch with a Jewish American deli flair. Eat up! In a city popping with restaurants that serve cuisine from around the world, an all-American moment took place on a recent evening at Dale Boca Café. A customer walked into the Argentinian restaurant on Winooski's Main Street and asked if Dale Boca sold gift cards. He wanted to use them as prizes in an NCAA men's basketball tournament pool. "We just had to do that," said John Anthony, who purchased $80 worth of Dale Boca gift cards. He's familiar with the café's fare from his workplace, PayData in Colchester, where the "amazing smell" of his coworkers' take-out lunches inspired the hoops-pool payoff, he said. You don't, of course, have to bet on Duke University's Zion Williamson to score a few meals at Dale Boca. The owners of the eight-table café, named for a soccer team in Argentina, aim to embrace a larger crowd. "We want to share our culture with the community," co-owner Neironi Rossi said. "Since we got here, we were connected with the community through food." Neironi Rossi owns the café with her partner, Leandro Bustos, the chef. Together they are running the restaurant and raising three bilingual children, ages 7, 4 and 2. The couple works closely with Javier Zirko, general manager at Dale Boca. "We are three amigos in a crazy adventure," said Neironi Rossi, 43, with a smile. 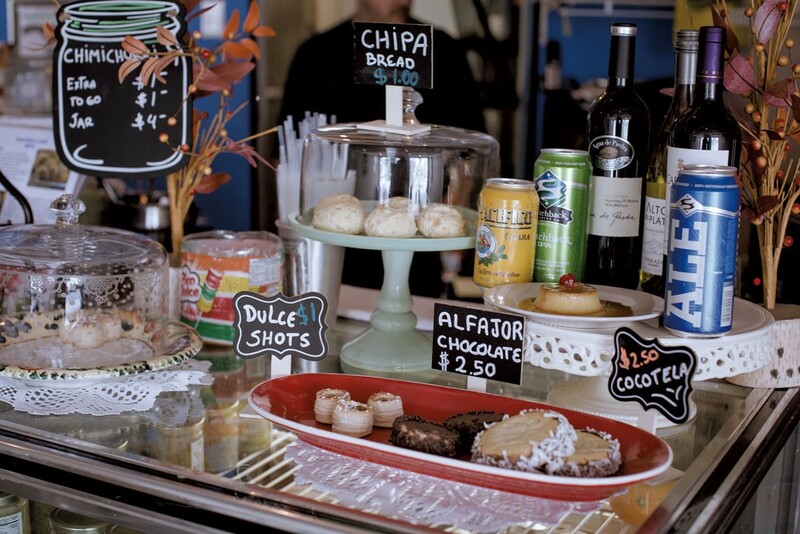 She and her partners believe their café is the only Argentinian restaurant in Vermont. Dale Boca, which sprang from a food-truck business, opened in December in the building that formerly housed Pho Dang, which has moved to a bigger location a few blocks north. Renovated last fall, the restaurant is bright and cheery, with Argentinian rock playing on the sound system and packages of tea and sweets native to Argentina stocked on shelves. West-facing windows catch the last beams of evening light. The menu presents a sampling of Argentinian food, distinct from North American cuisine yet possessed of an enticing and intriguing familiarity. Sausage sandwiches and a variety of beef filets are served with fries. There are pasta dishes and wraps stuffed with rice, beans and a choice of protein. I started with a pair of vegetarian empanadas — corn and onion, spinach and cheese. The crescent-shaped pastry that pockets the filling is flaky and light, its pleasing consistency almost belying the quick deep-fry that crisps the dough. The spinach filling brought back memories of creamed spinach, that oh-so-comforting, soft and gloppy dish that I savored on long-ago Thanksgiving plates. 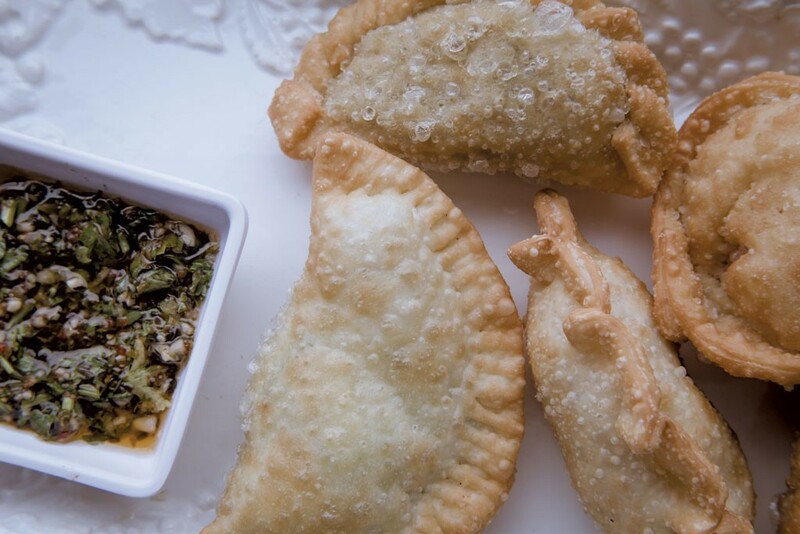 Dale Boca empanadas are served with housemade chimichurri sauce, an aromatic and pungent blend of chopped parsley and garlic thickly swimming in vinegar. I could have drunk it and requested a second round. At Zirko's suggestion, I followed the empanadas with a classic milanesa, a breaded and fried beef cutlet served with hand-cut fries. The fries are tossed with chimichurri and best eaten, I found, with a dab of house aioli (mayo, mustard, more chimichurri), a forkful of meat, and a bite of the lettuce and tomato that garnished the plate. Zirko, who is originally from Buenos Aires, told me that in Argentina you'll find milanesa "on every corner." The dish, which can be dressed up and riffed on, is as common as the hamburger in this country, he said, while chimichurri sauce is like the A.1. Steak Sauce of Argentina. The name "milanesa" indicates its roots in Italy; immigrants from that country settled in Argentina and influenced the cuisine there, Bustos said. He told me about the origins of a popular version of the milanesa called the napolitana. About 100 years ago, an Argentinian chef wanted to accommodate a late-arriving regular at his restaurant. To give renewed life to an hours-old dish, the chef embellished a standard milanesa with tomato sauce, mozzarella cheese and sliced ham. The napolitana is one of four milanesas, including a sandwich, served at Dale Boca. Bustos, 43, is from a small town in the northeastern Argentinian province of Chaco. He first came to this country in 2004 and spent six months working at a ski resort in South Lake Tahoe, Calif., then returned to Argentina for several years and attended culinary school. In 2010, he settled in Burlington, where he worked for a cleaning service and got a second round of culinary education — this time at Community Kitchen Academy in Burlington, where he learned about local food safety practices and regulations. 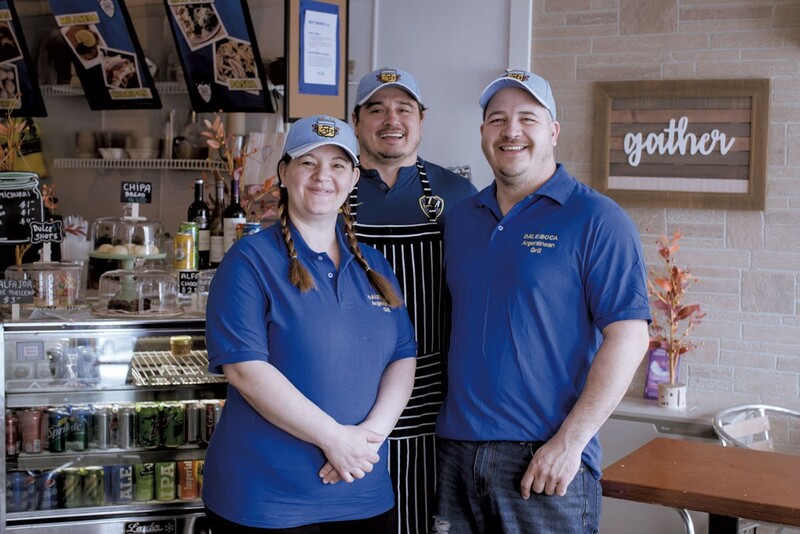 Neironi Rossi arrived in Burlington in 2008 and worked for a time at Souza's, a Brazilian restaurant then located on Burlington's Main Street. For 10 years, she was a loan officer at a bank, a career she gave up to open the restaurant with Bustos. With the arrival of warm weather, the Dale Boca crew will rev up the food truck for season No. 5, with service planned for the ArtsRiot Truck Stop, Leddy Park Beach Bites and the Champlain Valley Fair. The warm weather will also bring an addition to the Dale Boca menu: asado, or an array of wood-fire-grilled meats, an Argentine specialty. "For us the flavor [of the meat] is so good," Bustos said. "I just put some salt on it." Before I ate at Dale Boca, the product from Argentina I knew (and loved) best was malbec, a red wine. It's the house red at Dale Boca, and my glass the other night lasted through three courses. That included a few sips with my dessert: Neironi Rossi's flan. 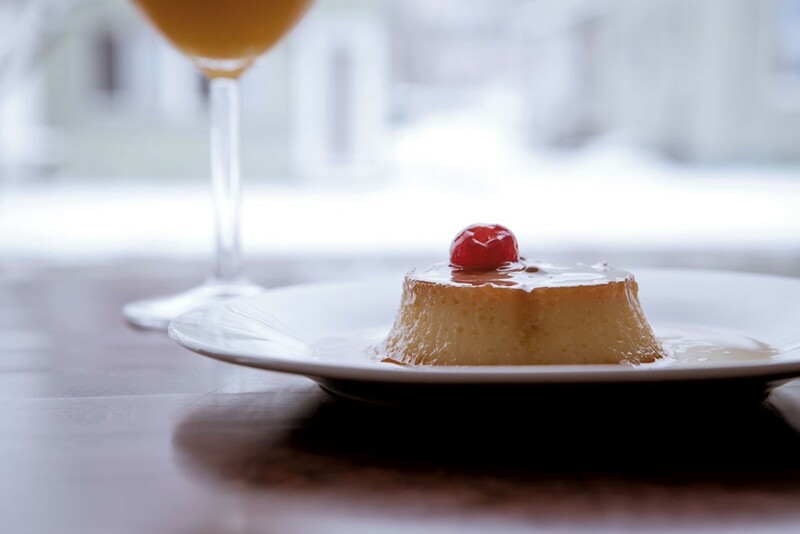 Her silky custard is crowned with a dollop of dulce de leche, which she also uses to fill a lovely little cookie. As I finished my meal, Zirko told me about an event Dale Boca hosts every Saturday night: Sabados Sociales, or Social Saturdays. From 9 p.m. until after midnight, the café serves empanadas, beer and wine to people who come in for conversation and board games. The event attracts an international crowd — Zirko has heard people talk Russian during a chess match, and others practice their Spanish as they play dominoes or Yahtzee. The crowd reflects the neighborhood's diversity, Zirko observed. "It's a culture mix," he said. "It kind of blows my mind." First, the soup: Beads of chicken fat floated atop the clear, delicate broth, partially obscured by a tangle of shredded chicken. Underneath, the nutty matzo balls came apart in crumbles, mingled with chunky cuts of carrot and celery. While the bowl didn't present as a traditional serving of matzo ball soup — usually the veggies are diced small, the matzos intact, and the meat either stringy or in small pieces — the singular flavor was spot-on. "There's a certain taste to matzo ball soup," said Shana Goldberger, owner of Winooski's Sweet Babu and a retail line of cookies and bars by the same name. "When I eat it, it gives me this huge wave of nostalgia. It tastes like my childhood." The matzos must be light and fluffy, she explained, firm but not dense. And they must be cooked in the broth so they're rich with flavor. "The longer they sit in the broth," Goldberger said, "the better they taste. Goldberger grew up eating matzo ball soup around her grandparents' tables during Jewish holidays. "It was always one of my favorite things to eat," she said. So, when the baker decided to offer breakfast and lunch at Sweet Babu's storefront at Winooski Falls Way, the soup "had to be part of the menu." 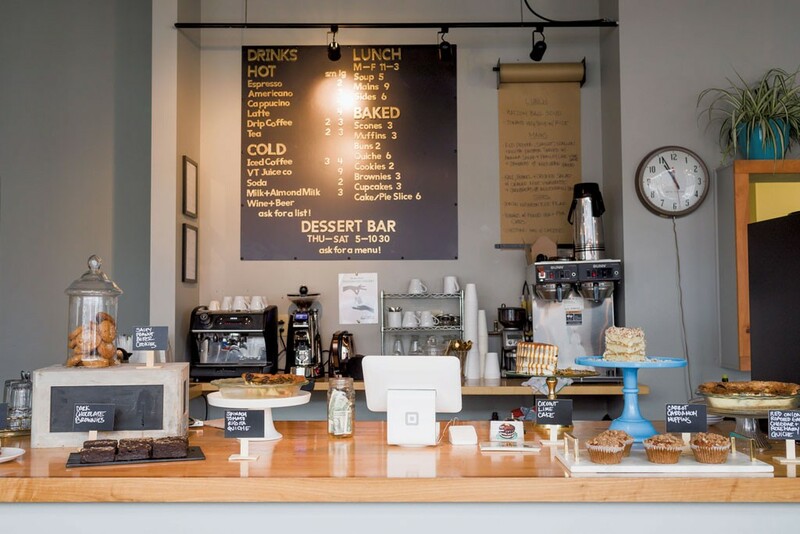 Since late February, Goldberger's been open on weekday mornings for drip coffee and espresso with muffins and scones, bagel bites and other baked goods. At lunch, she offers soups, changing main dishes and small bites such as knishes. Growing up in Connecticut and central Pennsylvania, Goldberger said, she bounced around a bit. Her family wasn't particularly food-oriented — "My parents can't cook, really" — but her grandmothers' cookery was "a constant" in her childhood. "I have a very emotional response to eating," the baker said. "My first and strongest food influences came from eating these really traditional Jewish American comfort foods." As a teenager, Goldberger cooked for herself a lot. Nurturing a sweet tooth but unable to digest lactose, she was forced to experiment with nondairy baking, she said: "It showed me that I could do my own thing." Goldberger moved to New York City for college and stayed there for years after graduation. Aching for a change, she moved to Vermont in 2013. "This was the place I was attracted to, to start over," she said. The self-taught baker began selling salted cookies and rich vegan brownies at the Winooski Farmers Market in 2014 under the name Sweet Babu — short for "babushka," an Eastern European term for old lady or grandmother. She's since cultivated a robust wholesale business, distributing sweets to co-ops and markets throughout Chittenden County and as far afield as South Royalton, Middlebury and Quechee. "It's been steady," Goldberger said of the cookie biz. "It's a slow burn, but it's growing." 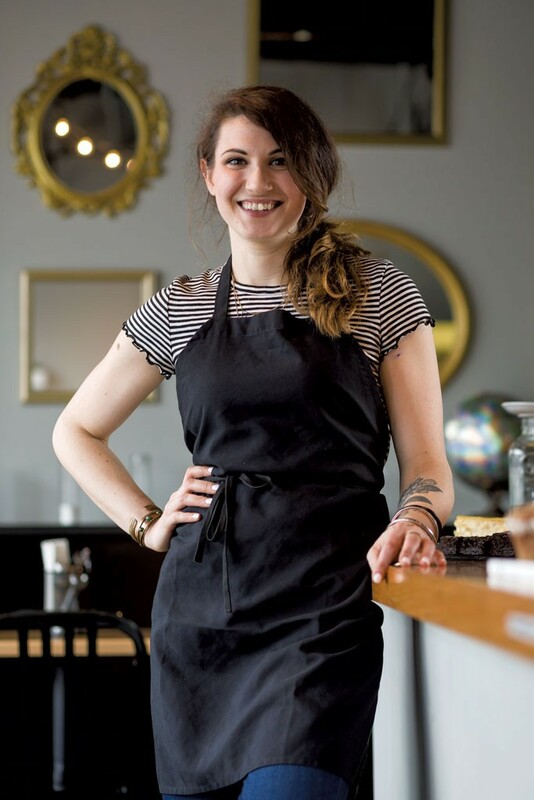 In 2016, when the Winooski Falls Way spot was still the Misery Loves Co. Incubator, the baker dabbled in plated-dessert and cocktail service during pop-up events there. Those pop-ups were a dress rehearsal for Sweet Babu's evening Dessert Bar, which Goldberger debuted in the same storefront last June. At first, Sweet Babu shared the address with Blossom Whole Food Kitchen and Catering, whose owner, Tessa Holmes, used the kitchen to prep for off-site events and serve casual lunches and occasional suppers. 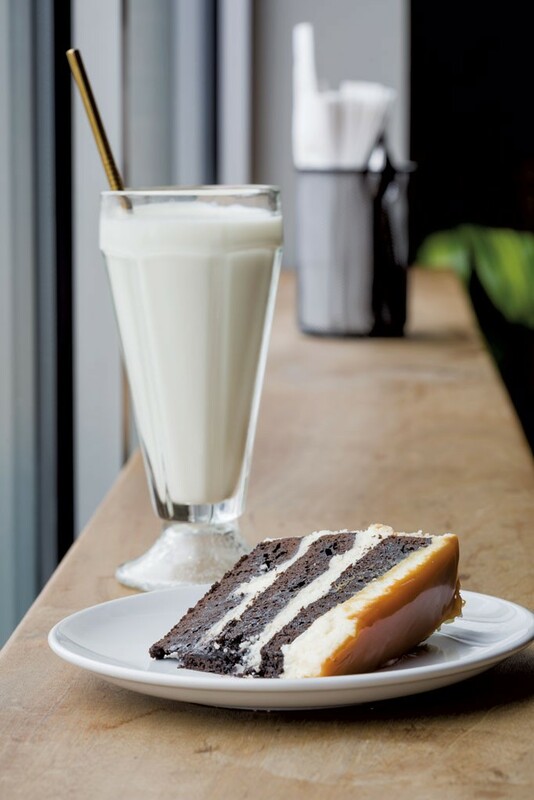 Several evenings a week, Goldberger took over, pairing pies, tarts, cakes, cookies and ice cream with local beers and dessert-friendly wines. When Holmes decided to move out, Goldberger opted to go solo on the lease and start serving breakfast and lunch herself. Diners will find the baker's Jewish heritage expressed in subtle touches; her cooking is more interpretive than dogmatic. "My grandmothers definitely didn't teach me how to cook," Goldberger said. But she had access to a little box of index cards on which one grandmother's recipes and notes were jotted. "My mom was really good about preserving everything," she said. "Without her, I don't know if any of that stuff would have survived." The note cards were helpful — to a point. "[The recipe will] say something like, 'Add one cup from a water glass and cook it until it's done,'" Goldberger said. The baker cross-referenced her grandmother's recipes with Jewish cookbooks by Joan Nathan and added her own twists. On one day, her lunch menu might include lamb meatballs stuffed with feta and garlicky kale salad with crisped chickpeas; on another, pork-and-beef chili or brisket braised in red wine, charred cauliflower, and barley pilaf. Mostly, the cook builds her menu around what she wants to eat. "We have what we have for lunch," Goldberger said. "If you're into that, come in and eat. There are plenty of places in this neighborhood where you can go in and get the same thing every day, so we're an alternative to that." The café's large array of sweets is also a novelty in town. 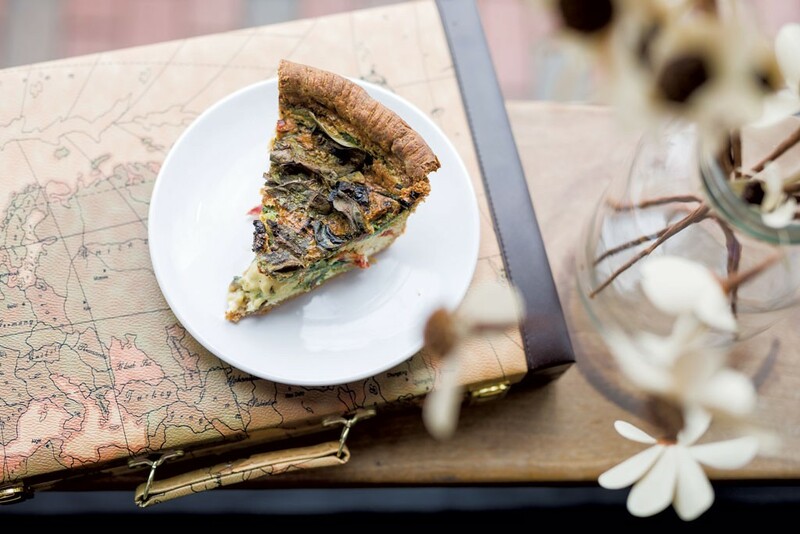 On a windy early-March afternoon, Sweet Babu's butcher-paper menu offered quiches stuffed with sun-dried tomatoes and herbs or with softened potatoes and cubes of brisket. For a late lunch, my friend and I ordered one of each. In both, the eggs were smooth, soft — custardy in that way the finest quiches are — and so thick with cheddar that I considered asking for crackers to go with mine. The crust was the sort of toasty all-butter number only a skilled baker can muster. My omnivore's palate couldn't complain about a hearty plate of vegan lasagna, which was loaded up with fresh veggies and herbed tofu-cashew "ricotta" and slicked with marinara that carried a nice tomato zing. "I've been making that lasagna for myself for years," Goldberger said. Regardless of what you order, you'll want to save room for a cookie. Some are crumbly and rich with peanut butter and an indulgent — but not cloying — amount of sugar. The ones studded with chocolate chips are all buttery chew. Flake salt sprinkled on both adds crunch and makes everything even better than you might expect. The end-of-meal sweets reminded me that though Goldberger had just served my friend and me a very respectable lunch, she's a gifted baker first and foremost. After a month in the breakfast-and-lunch business, Goldberger said her café service is catching on. "I'm actually surprised," she said. "We're not slammed every day, but people quickly figured out that we're here, and we have a great group of regulars." Then again, she noted, that's no rarity on this side of the river: "It's a Winooski thing to see the same people every day." The original print version of this article was headlined "Blooming Onion City"